"We may not know where we're going, but we sure as heck ought to know where we stand." As I previously predicted, Mother Yellen's Fed decided to keep interest rates unchanged at 1.0-1.25% although, in forward guidance, a majority of Fed officials anticipated one more 25bp rate hike in December with 3 more hikes expected in 2018; to wit, I still say we're closer to a rate cut than hike but that's an argument best saved for another time. 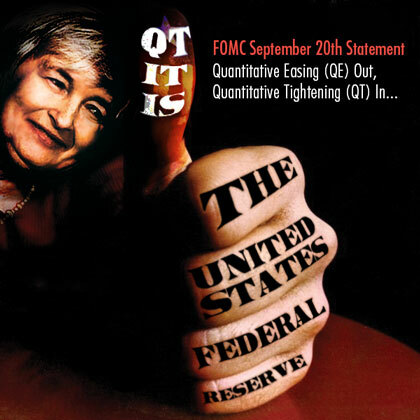 Equally anticipated, beginning in October the Fed will initiate its "balance sheet normalization," or in the words of Peter Boockvar, (h/t John Mauldin), "Quantitative Tightening (QT)." With $4.5 trillion in holdings the Fed will gradually, over the course of several years, reduce its holdings by allowing $6 billion in Treasury securities and $4 billion in mortgage-backed securities mature per month with increases to $30 billion and $20 billion respectively. 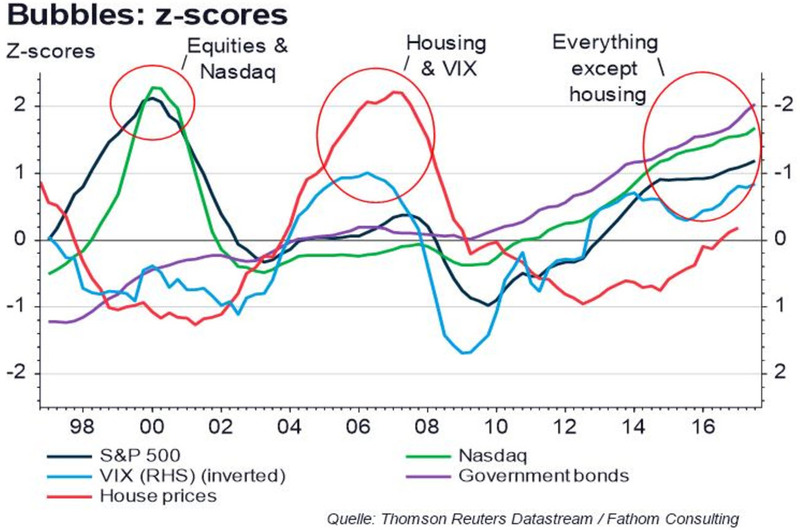 As we now embark upon a new era in investing, and in continuation of Part 1 of our Flight to Safety series, what follows is a synthesis of views/charts from various market participants answering Marks' quote above, i.e. we ought to know where we stand right now. 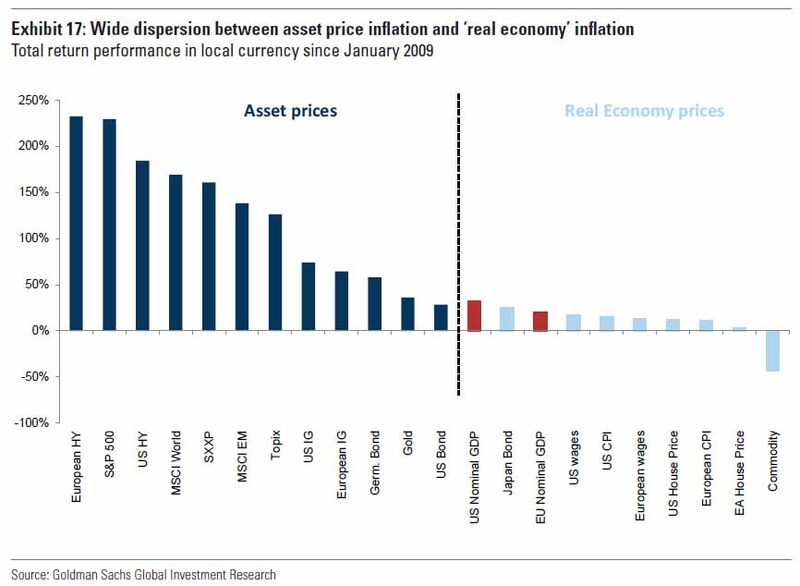 The amount of monetary stimulus increasingly imposed on the financial system creates false signals about the economy's true growth rate, causing a vast misallocation of capital, impaired productivity and weakened economic activity. To help quantify the amount of stimulus, please consider the graph below. Federal Reserve (Fed) stimulus comes in two forms as shown above. First in the form of targeting the Fed Funds interest rate at a rate below the nominal rate of economic growth (blue). Second, it stems from the large scale asset purchases (Quantitative Easing -QE) by the Fed (orange). 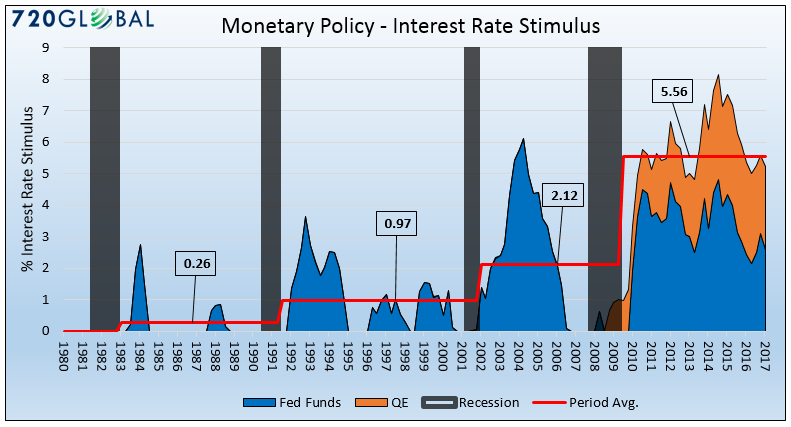 When these two metrics are quantified, it yields an estimate of the average amount of stimulus (red) applied during each post-recession period since 1980. It has been almost ten years since the 2008 financial crisis and the Fed is applying the equivalent of 5.25% of interest rate stimulus to the economy, dwarfing that of prior periods. The graph highlights that the Fed has been increasingly aggressive in both the amount of stimulus employed as well as the amount of time that such stimulus remains outstanding….the rise in the prices of many financial assets is not based on improving economic fundamentals but simply the stimulative effect that QE and low interest rates have on investor confidence and financial leverage. (1) Invest as you always have and expect your historic returns. (2) Invest as you always have and settle for today's low returns. (3) Reduce risk to prepare for a correction and accept still-lower returns. (4) Go to cash at a near-zero return and wait for a better environment. (5) Increase risk in pursuit of higher returns. (6) Put more into special niches and special investment managers. It would be sheer folly to expect to earn traditional returns today from investing like you've done traditionally (#1). With the risk-free rate of interest near zero and the returns on all other investments scaled based on that, I dare say few if any asset classes will return in the next few years what they've delivered historically. Thus one of the sensible courses of action is to invest as you did in the past but accept that returns will be lower. Sensible, but not highly satisfactory. No one wants to make less than they used to, and the return needs of institutions such as pension funds and endowments are little changed. Thus #2 is difficult. If you believe what I said in the memo about the presence of risk today, you might want to opt for #3. In the future people may demand higher prospective returns or increased prospective risk compensation, and the way investments would provide them would be through a correction that lowers their prices. If you think a correction is coming, reducing your risk makes sense. But what if it takes years for it to arrive? Since Treasuries currently offer 1-2% and high yield bonds offer 5-6%, for example, fleeing to the safety of Treasuries would cost you about 4% per year. What if it takes years to be proved right? Going to cash (#4) is the extreme example of risk reduction. Are you willing to accept a return of zero as the price for being assured of avoiding a possible correction? Most investors can't or won't voluntarily sign on for zero returns. All the above leads to #5: increasing risk as the way to earn high returns in a low-return world. But if the presence of elevated risk in the environment truly means a correction lies ahead at some point, risk should be increased only with care. As I said in the memo, every investment decision can be implemented in high-risk or low-risk ways, and in risk-conscious or risk-oblivious ways. High risk does not assure higher returns. It means accepting greater uncertainty with the goal of higher returns and the possibility of substantially lower (or negative) returns. I'm convinced that at this juncture it should be done with great care, if at all. And that leaves #6. "Special niches and special people," if they can be identified, can deliver higher returns without proportionally more risk. That's what "special" means to me, and it seems like the ideal solution. But it's not easy. Pursuing this tack has to be based on the belief that (a) there are inefficient markets and (b) you or your managers have the exceptional skill needed to exploit them. Simply put, this can't be done without risk, as one's choice of market or manager can easily backfire. As I mentioned above, none of these possibilities is attractive or a sure thing. But there are no others. What would I do? For me the answer lies in a combination of numbers 2, 3 and 6.